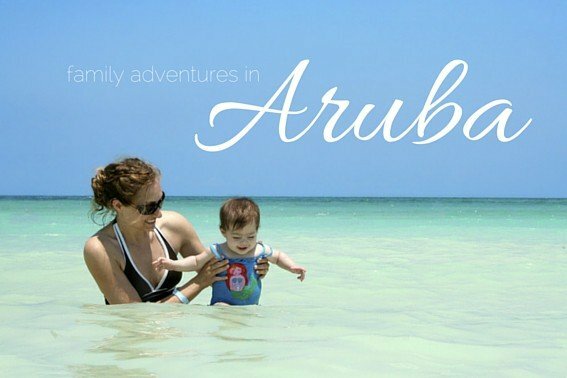 Kid Friendly Aruba…One Happy Island! Aruba is unique among the Caribbean islands. The Dutch influence gives the island an international feel with multi-lingual locals, luxury resorts and shopping, and U.S. dollars accepted everywhere. Kid friendly Aruba has soft, sandy beaches on the western shores and rocky, desert landscapes along the other coasts. Families, mainly from North America, flock to this island nation to enjoy water activities, delicious food, world-class customer service, and fun in the sun. 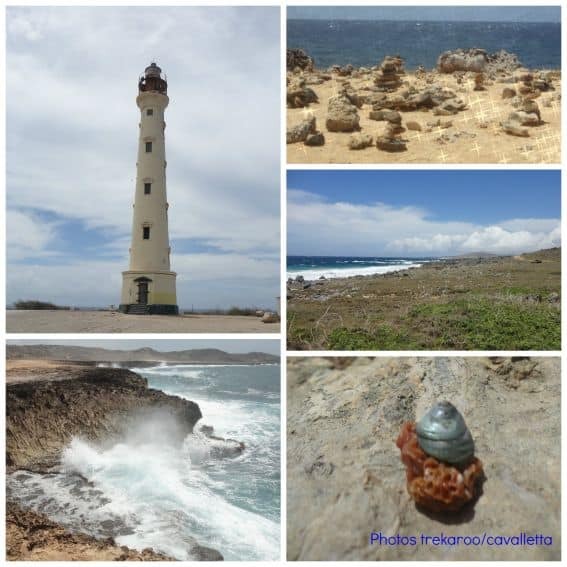 The islanders are hospitable and our days on Aruba consisted of both relaxing and adventurous activities to keep us as busy as we wanted to be. After a short 15-minute ride through town on the prearranged hotel shuttle, we arrived at the Aruba Marriott and Stellaris Casino. Airport shuttles can be easily arranged in advance through the resort. Of course, an additional fee does apply but the convenience is worth it! 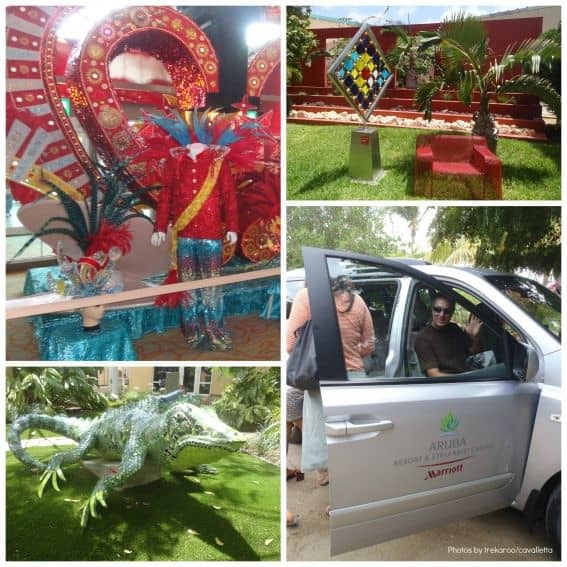 You can always opt to take a taxi or rent a car and drive to the resort. The taxis charge a set rate for trips rather than operate on a meter so just ask the driver for a rate sheet when you arrive at the airport. Rates are shown in US dollars as well as Aruban Florin. Drivers will gladly accept US dollars for payment. What a relief! No need to exchange currency. 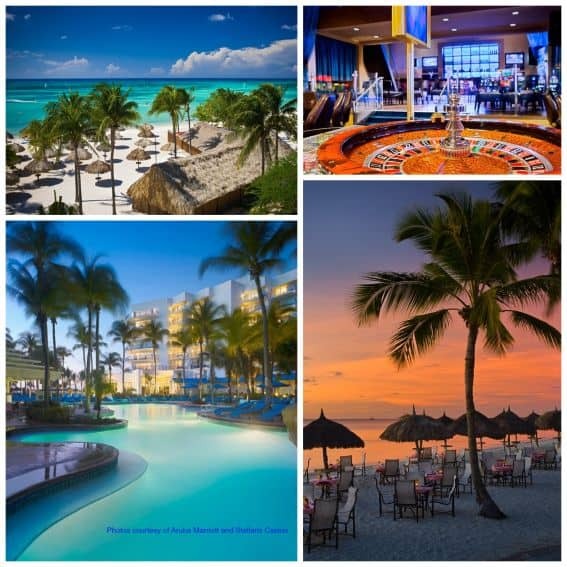 The Aruba Marriott and Stellaris Casino was recently renovated and offers a variety of fun activities for the whole family to do. The kiddos especially liked the green, welcoming drink and cool washcloths at check in, and I appreciated the bowls of fresh apples. From the private balcony of our spacious, modern room, we could see the main pool and tiki huts along the beach. Our first stop was to change into our swimsuits! The poolside and beachfront lounge chairs are first come first served but can be reserved for a small fee. Swimming through the waterfall to the pool bar for an Aruba Arriba, a local cocktail, while the kiddos played water volleyball with new friends was a great way to start our vacation. Spotting the colorful lizards and iguanas among the tropical landscaping quickly became a daily quest for the kids with each bragging about who found the biggest iguana every day. While the kids enjoyed crafting and game playing at the supervised Kids Club, we reconnected in the adults only H2O pool, played tennis on the lighted hard courts, indulged in a spa treatment at the Mandara spa, and tried our luck in the Stellaris Casino. All these indulgences were within steps of the Kids Club activity zone! Although we did not strike it rich at the casino, we felt like winners. Once we picked the kids up from their Club, the boys played a quick basketball game while the girls pretended to be pirates on the pirate ship playground. The next day, we all enjoyed the challenges of air hockey in the game room and family style ping-pong on the beach. For the record, the girls beat the boys! Working up an appetite was easy with all of the activities available on property. Fortunately, the resort’s world-class chefs created familiar dishes that pleased our picky eaters. We also tried some new favorites including the best grouper we’ve ever tasted! One of my favorite moments was eating the fresh catch of the day at sunset with my toes in the sand. There are lots of gluten-free options, made to order items, and fresh fruit on the lavish breakfast buffet at La Vista. The Sunday Brunch buffet, served with mimosas, is worth every penny! Chef George and his team change the menu often, which keeps things interesting. When we got back from an afternoon touring the island, the kids loved ordering their own custom-made sandwiches and choosing toppings for their ice cream from the lobby café. The grown-ups ate sushi and tried the local beer, Balashi, at the lobby sushi bar. The café, open around the clock, also serves breakfast pastries, gluten-free breads, and bagels for on-the-go quick meals. Time after time, we experienced Aruba’s well-known hospitality. Most of the islanders speak four languages fluently (Dutch, English, Spanish, and Aruba’s own Papiamento) which made it super easy to communicate. Wherever we explored on the 19-mile-long by 6-mile-wide stretch of the island, we felt safe. One day, we took a shuttle bus and then a short boat ride to De Palm Island, an all-inclusive water playground for kids of all ages. Snorkeling with the blue parrotfish and learning to salsa dance were our favorite activities. The kids really liked splashing in the water spray park, racing down the waterslides, and playing beach volleyball. 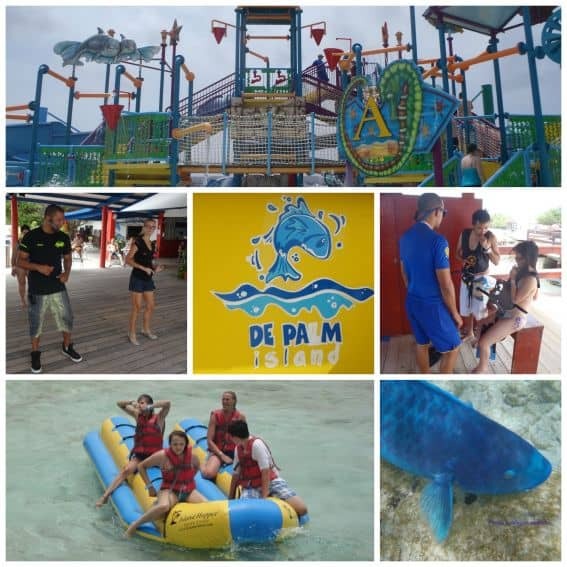 For a heart-stopping thrill ride, the adults braved a trip on the banana boat. It’s not for the faint of heart! Afterwards, we were ready for an island cocktail and feasted on the kid-friendly, all-you-can-eat lunch buffet. Snuba (surface air supplied diving) and an Undersea Walk are available for an additional fee but there are plenty of free activities to keep everyone happy throughout the day. We wanted to try traditional Dutch food so we ventured to The Dutch Pancake House in downtown Oranjestad. The kids ordered Surprise Pancakes that came with a treasure box treat at the end of the meal. Not only did they try something new, they liked it, too! My savory mushroom and cheese pancake was delish! I got my own special gift with a box of pancake mix so I could make these Dutch treats back home. Within walking distance from the Aruba Marriott is the Beach Tennis Aruba club where we learned to play Moomba from the resident pro. Moomba is a quick paced beach tennis game but easy to learn for any age. Walking back to the Marriott from the Tennis Club is easy. Along the way, we strolled through the Palm Beach shopping district but knew that excellent shopping was also available at our hotel. Earlier that morning, we hopped aboard the Marriott’s hotel shuttle to the nearby Butterfly Farm. The knowledgeable tour guides are excellent at teaching the kids something new about butterflies. 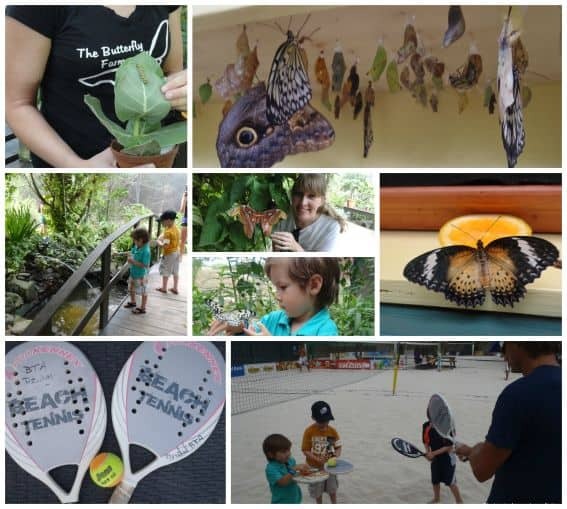 We were amazed to see butterflies in all stages of their life cycle at this family friendly farm. We even got to feed the resident koi fish and turtles during our visit! Our weekend at the Aruba Marriott was a relaxing, comfortable adventure thanks to the warm, inviting people we met, as well as the fabulous hotel amenities. After just a few days, we were told that we could call ourselves locals. The casual, accommodating island has us wishing for a return visit. Aruba is truly one happy island! Disclosure: Special thanks to the Aruba Marriott and Stellaris Casino for hosting me on this adventure. As always, the views expressed are my own. Lisa Marie…This looks fabulous. Thanks for sharing! Thanks Michelle. Aruba is pretty fabulous! 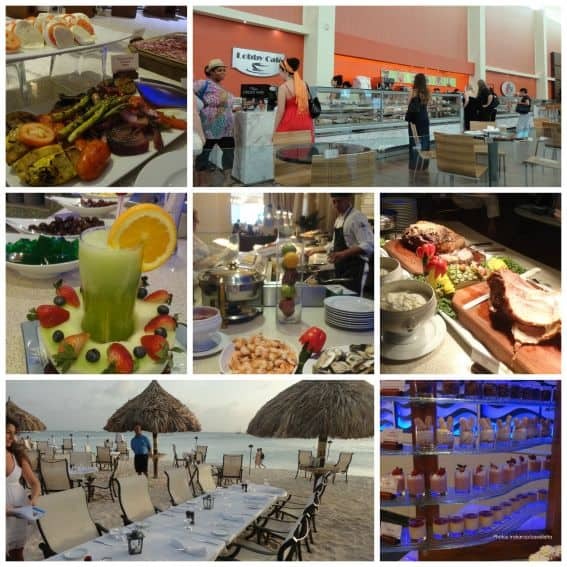 Thanks for the great post on mi dushi, Aruba! Family fun abounds!